Following an unforgettable performance at Music Beyond Borders, Syrian composer and clarinetist Kinan Azmeh returns to give the world premiere of his clarinet concerto on February 6. 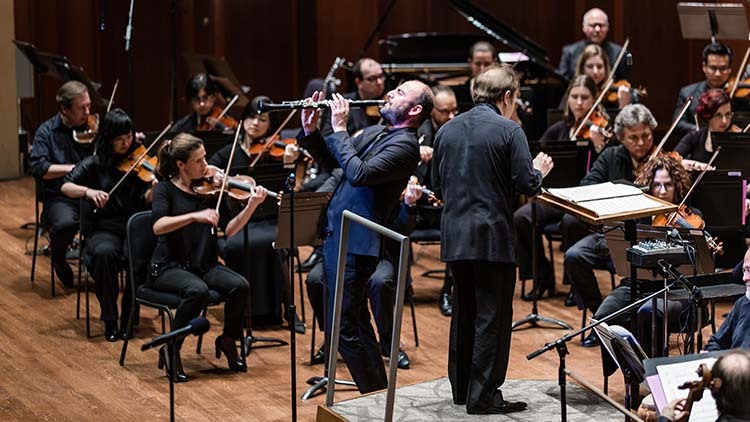 Syrian composer and clarinetist Kinan Azmeh first appeared as a soloist with the Seattle Symphony exactly two years ago. His unforgettable performance at Music Beyond Borders, a concert featuring music from the seven countries banned by the February 2017 executive order, inspired people around the world. The concert made a big impact on our city, but it also made a big impact on Azmeh, who had been stranded in Beirut as a result of the travel ban. He went on to say that this piece, “is free from any programmatic or autobiographical information. The only summary that can be given here is that there is an introduction, there is a lullaby and there is an ecstatic dance in one of my favorite rhythms in Arabic music called ‘Katakufti’ or ‘Nawari,’ and in a similar fashion to many of my earlier works, the soloist has lots of room to improvise. In addition to Azmeh’s new concerto on February 6, he’ll also be giving an encore performance of The Wedding from his Suite for Improvisor and Orchestra. Watch the video below of his exhilarating performance at Music Beyond Borders. Get your tickets now to this one-night-only performance of the Seattle Symphony with Kinan Azmeh and his longtime collaborators, the Silkroad Ensemble.